This section goes through some examples and recipes to help you use lifelines. If you are looking for some full example usage of lifelines, there are full Jupyter notebooks here. will produce the difference at every relevant time point. A similar function exists for division: divide. However, for rigorous testing of differences, lifelines comes with a statistics library. See below. The logrank test has maximum power when the assumption of proportional hazards is true. As a consequence, if the survival curves cross, the logrank test will give an inaccurate assessment of differences. 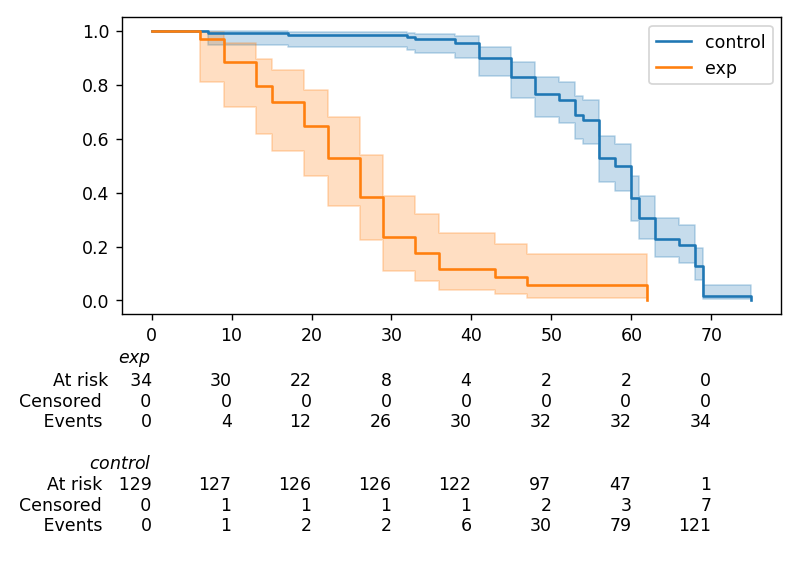 If you have more than two populations, you can use pairwise_logrank_test (which compares each pair in the same manner as above), or multivariate_logrank_test (which tests the hypothesis that all the populations have the same “death” generation process). Often analysts want to compare the survival-ness of groups at specific times, rather than comparing the entire survival curves against each other. For example, analysts may be interested in 5-year survival. Statistically comparing the naive Kaplan-Meier points at a specific time actually has reduced power. By transforming the Kaplan-Meier curve, we can recover more power. 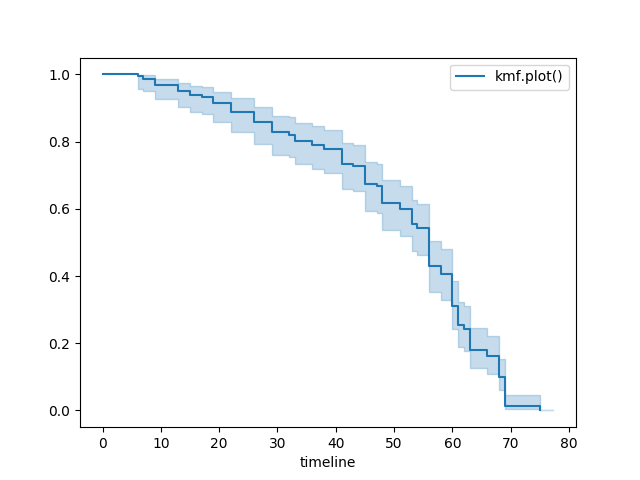 The function statistics.survival_difference_at_fixed_point_in_time_test uses the log(-log) transformation implicitly and compares the survival-ness of populations at a specific point in time. If using lifelines for prediction work, it’s ideal that you perform some type of cross-validation scheme. This cross-validation allows you to be confident that your out-of-sample predictions will work well in practice. It also allows you to choose between multiple models. #create the three models we'd like to compare. 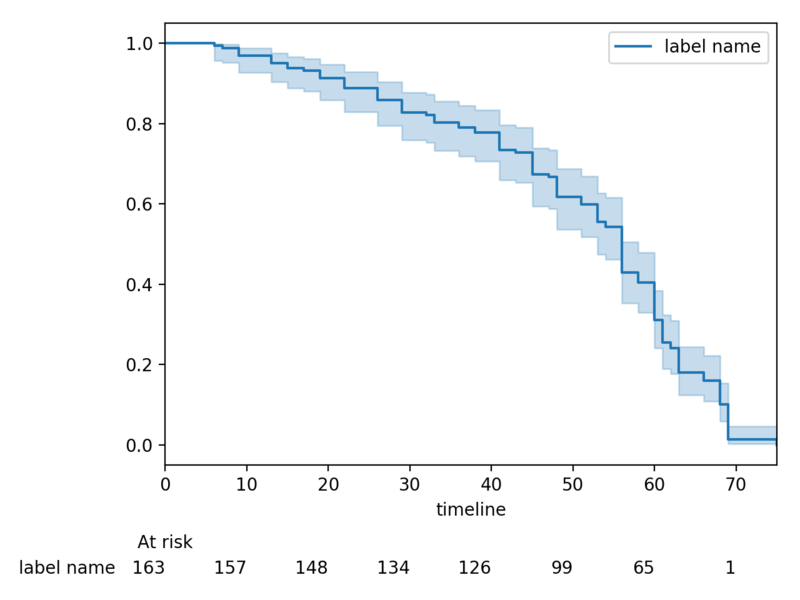 From these results, Aalen’s Additive model with a penalizer of 10 is best model of predicting future survival times. QQ plots normally are constructed by sorting the values. However, this isn’t appropriate when there is censored data. In _lifelines_, there are routines to still create QQ plots with censored data. These are available under lifelines.plotting.qq_plots, and accepts fitted a parametric lifelines model. This graphical test can be used to invalidate models. For example, in the above figure, we can see that only the log-normal parametric model is appropriate (we expect deviance in the tails, but not too much). Another use case is choosing the correct parametric AFT model. The qq_plot also works with left censorship as well. 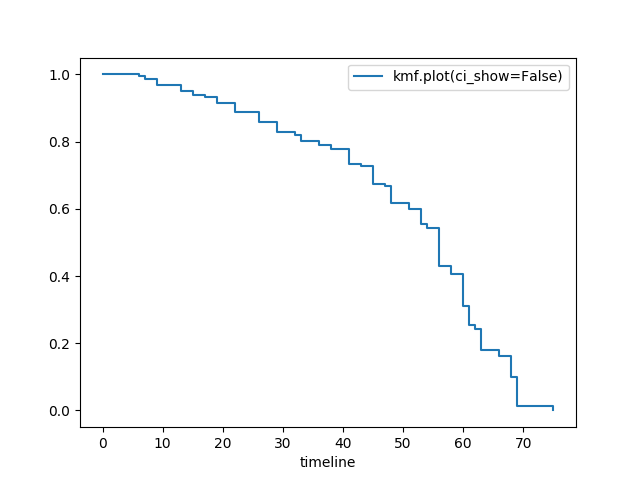 This is deprecated and we suggest to use kmf.plot_cumulative_density() instead. Some lifelines classes are designed for lists or arrays that represent one individual per row. If you instead have data in a survival table format, there exists a utility method to get it into lifelines format. # weights, W, is the number of occurrences of each observation - helps with data compression. Perhaps you are interested in viewing the survival table given some durations and censoring vectors. lifelines will intelligently forward-fill the estimates to unseen time points. 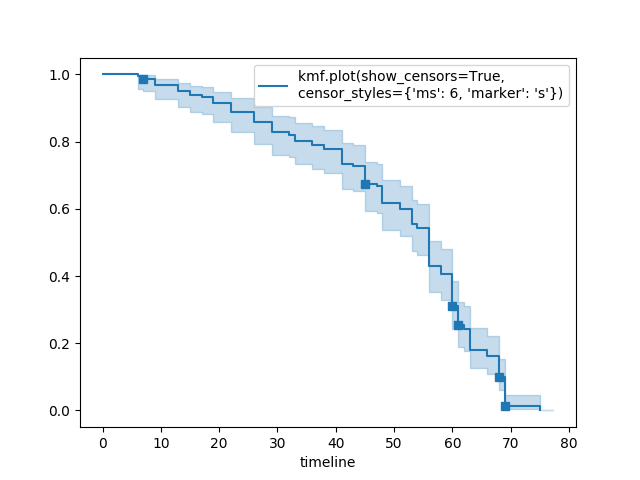 (ended_at IS NOT NULL) AS "E"
For Cox time-varying models, we discussed what the dataset should look like in Dataset creation for time-varying regression. Typically we have a base dataset, and then we fold in the covariate datasets. Below are some SQL queries and Python transformations from end-to-end. DATEDIFF('dd', dt.started_at, ft.event3_at) AS "E3"
Initially, this can’t be added to our baseline time-varying dataset. Using utils.covariates_from_event_matrix we can convert a dataframe like this into one that can be easily added. This assumes you have estimates of the probability of event occuring for both the experiment and control group. This could be determined from previous experiments. Suppose you wish to measure the hazard ratio between two populations under the CoxPH model. To determine the statistical power of a hazard ratio hypothesis test, under the CoxPH model, we can use lifelines.statistics.power_under_cph. That is, suppose we want to know the probability that we reject the null hypothesis that the relative hazard ratio is 1, assuming the relative hazard ratio is truly different from 1. This function will give you that probability. First check: look for ConvergenceWarning in the output. Most often problems in convergence are the result of problems in the dataset. lifelines has checks it runs against the dataset before fitting and warnings are outputted to the user. delta contains nan value(s). : First try adding show_progress=True in the fit function. If the values in delta grow unbounded, it’s possible the step_size is too large. Try setting it to a small value (0.1-0.5). adding a penalizer to the model, ex: CoxPHFitter(penalizer=0.1).fit(…) until the model converges. In the print_summary() , the coefficients that have high collinearity will have large (absolute) magnitude in the coefs column. using the variance inflation factor (VIF) to find redundant variables. Some coefficients are many orders of magnitude larger than others, and the standard error of the coefficient is also large or there are nan’s in the results. This can be seen using the print_summary method on a fitted CoxPHFitter object. Look for a ConvergenceWarning about variances being too small. The dataset may contain a constant column, which provides no information for the regression (Cox model doesn’t have a traditional “intercept” term like other regression models). Related to above, the relationship between a covariate and the duration may be completely determined. For example, if the rank correlation between a covariate and the duration is very close to 1 or -1, then the log-likelihood can be increased arbitrarily using just that covariate. Look for a ConvergenceWarning after the fit call. Another problem may be a collinear relationship in your dataset. See point 3. above. If adding a very small penalizer significantly changes the results (CoxPHFitter(penalizer=0.0001)), then this probably means that the step size in the iterative algorithm is too large. Try decreasing it (.fit(..., step_size=0.50) or smaller), and returning the penalizer term to 0. If using the strata argument, make sure your stratification group sizes are not too small. Try df.groupby(strata).size(). The original dataset has 432 rows, while the grouped dataset has 387 rows plus an additional weights column. CoxPHFitter has an additional parameter to specify which column is the weight column. The fitting should be faster, and the results identical to the unweighted dataset. This option is also available in the CoxTimeVaryingFitter. The second use of weights is sampling weights. 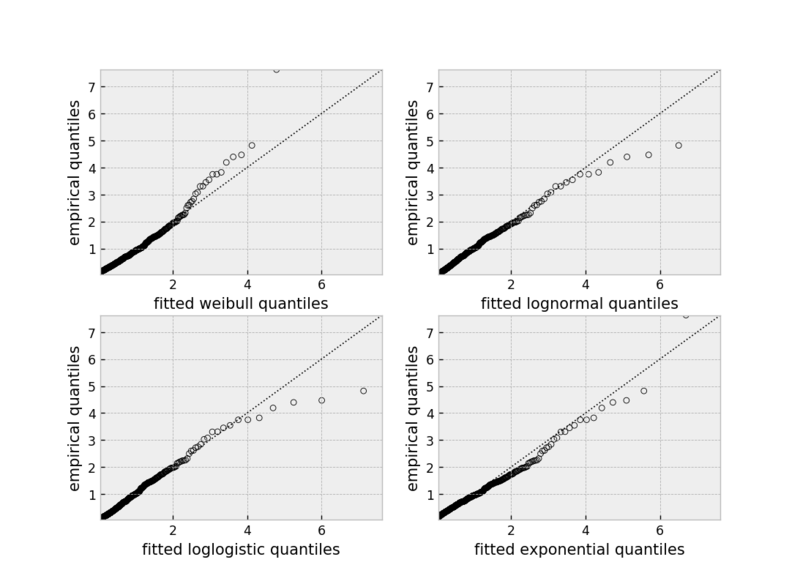 These are typically positive, non-integer weights that represent some artificial under/over sampling of observations (ex: inverse probability of treatment weights). It is recommened to set robust=True in the call to the fit as the usual standard error is incorrect for sampling weights. The robust flag will use the sandwich estimator for the standard error. The implementation of the sandwich estimator does not handle ties correctly (under the Efron handling of ties), and will give slightly or significantly different results from other software depending on the frequeny of ties. There are cases when your dataset contains correlated subjects, which breaks the independent-and-identically-distributed assumption. What are some cases when this may happen? If using a matching technique, like propensity-score matching, there is a correlation between pairs. In both cases, the reported standard errors from a unadjusted Cox model will be wrong. In order to adjust for these correlations, there is a cluster_col keyword in CoxPHFitter.fit that allows you to specify the column in the DataFrame that contains designations for correlated subjects. For example, if subjects in rows 1 & 2 are correlated, but no other subjects are correlated, then cluster_col column should have the same value for rows 1 & 2, and all others unique. Another example: for matched pairs, each subject in the pair should have the same value. Specifying cluster_col will handle correlations, and invoke the robust sandwich estimator for standard errors (the same as setting robust=True).